Luso Aloja Review 2019: Is Luso Aloja a Good Hosting? Luso Aloja provides shared web hosting and virtual private servers with SSD storage, plus domain registration, web design, email marketing, and SSL certificates at very reasonable prices. Customers enjoy free CDN services courtesy of Cloudflare. Luso Aloja was founded in 2009 by two entrepreneurs who had the vision to offer personalized services to customers. 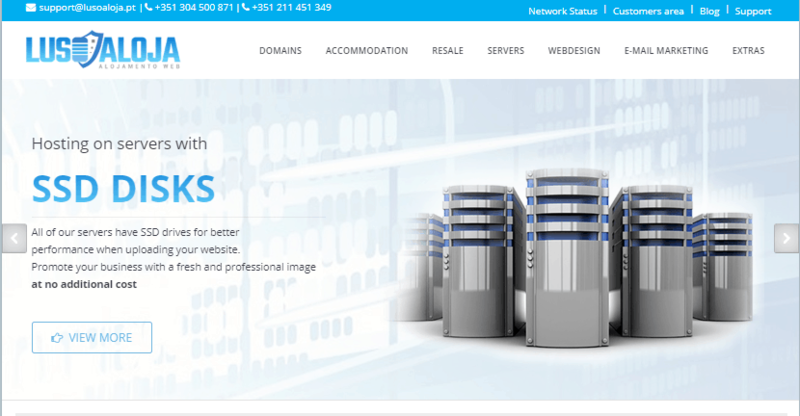 Their company is a one-stop-shop for domain registration, web design, and web hosting. As of 2015, Luso Aloja had more than 600 active customers and 1,000+ domains under its umbrella. Luso Aloja operates robust hardware and a redundant network. Though cheap, their cPanel-based Linux hosting is packed with features and rich in functionality. Subscriptions include access to standard hosting features such as MySQL, PHP, web-based emails, Cloudflare, and unlimited subdomains. R1Soft ensures you will never fail to back up your data. With 50+ Softcaulous scripts, you can create Joomla, Drupal, or WordPress CMS websites, or a Magento or OpenCart e-store secured with SSL. Those with little programming experience can create a static website using the RVsitebuilder tool’s easy drag-and-drop interface. Under Windows hosting, you will find four plans (with the Plesk control panel) that provide full support for apps built on ASP or ASP.NET 4.5 technology. Your subscription includes access to Microsoft SQL Server databases, ample disk space, unlimited emails, and unmetered monthly traffic. With this plan, you’ll never worry about losing data because they do daily backups of your website and databases. For greater privacy and more configuration options, you should choose one of the virtual private servers (VPS) that run on Intel Xeon processors. You can order up to eight CPU cores with 16GB RAM and SSD or SATA3 HDD storage. You have the freedom to install and configure your preferred operating system, WHM/cPanel, and other apps yourself, or you can ask for assistance. For an easy ride, I recommend their Managed VPS packages that are powered by premium hardware. If you would like to take charge of your remote machines, you can order unmanaged servers with cPanel or Plesk control panels. Your package includes high-grade hardware with powerful processors. Backups are automated. Nameservers are dispersed in different regions, so you can resolve domain issues even if servers are down. Although you will have the freedom to operate your server, onsite technicians will monitor and maintain it for you. Luso Aloja makes Namecheap, iPage, and BlueHost (the cheapest hosts in the market) look expensive. You get up to 30% discount if you sign up for one year or more, and all plans come with a 30-day money-back guarantee. You can pay by credit/debit card, bank transfer, or PayPal. Customers don’t just enjoy 24/7 support, but personalized services too. The support team does all the hard work to ensure your servers and websites run smoothly, and they’ll move your website, emails, or domain to Luso Aloja for free. You can reach out to the support team via live chat or their ticketing system, with ticket responses typically taking less than an hour. Luso Aloja gives you high-performance VPS and feature-rich shared Linux and Windows hosting plans at dirt cheap prices. Wondering how Luso Aloja stacks up against other Web Hosting companies? Enter any other Web Hosting company and we will give you a side-by-side comparison.